Diabetes complication isn’t a nice subject. Nobody wants to hear about it, even less suffer from it. If a loved one or even you are suffering from diabetes complication, it’s a good idea to maintain calm and follow your doctor’s orders. If the patient doesn’t follow the instructions, the next step is death, and no one wants to reach that stage. 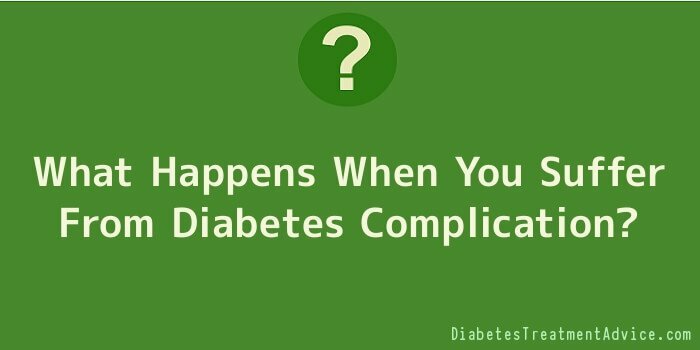 Diabetes complication doesn’t just appear from one moment to the next. It is a process that accumulates itself after years of body decay. If a person maintains a stabilized sugar level, there is no reason whatsoever to suffer from diabetes complication. In order to combat this future state, the best way to do it is with discipline. But what if the patient already suffers from diabetes complication? What will they expect to see? The first manifestations will be caused by the damage generated in the blood vessels. If we take this into consideration, we can divide the consequences in two types of complications: small vessels disease complications and large vessel disease complication. Small vessels disease complications cause a series of problems that are usually associated with diabetes. The main ones are blindness and necrosis, which ends in the amputation of the damaged limb. Another, less known consequence is renal failure. If this happens, the patient may need a transplant or a machine to continue living. Large vessel disease complications generate more serious medical complications. Strokes are a common cause of death for people suffering from terminal diabetes. Peripheral and ischemic heart disease can also appear. In the case of peripheral heart disease, the limbs may be compromised, ending in the amputation of limbs due to an ulcer. Instead, ischemic heart disease attacks the heart. The main muscle of the body finds itself without an adequate supply of blood. Known as the main reason of death among western countries, it generates a lot of pain to the patient. Unfortunately, the people who suffer from diabetes have a low probability of living once they are affected by this condition. Do not wait until things are too late. If a patient starts with small vessels disease complications, is because he hasn’t adequately controlled the sugar level in his blood. The only choice that the patient has is to change his lifestyle. He may have loosed his vision or even his limb, but it isn’t a death sentence. Nobody needs to wait until the terminal stage of this disease.